There may be instances where we may require multiple version of Node Js for different applications. 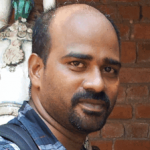 For this kind of situations, Node Version Manager comes as a rescue to manage different versions of Node Js in a single instance of SUSE Linux. If you are looking for installation of a specific version of Node Js, then check out my other article on installing latest version of Node Js in SLES here. This installs nvm and configures the system. Close and re-open the terminal for the changes to take effect. If you have already installed Node Js (like the way explained here), remove that version of Node Js for nvm to work correctly. 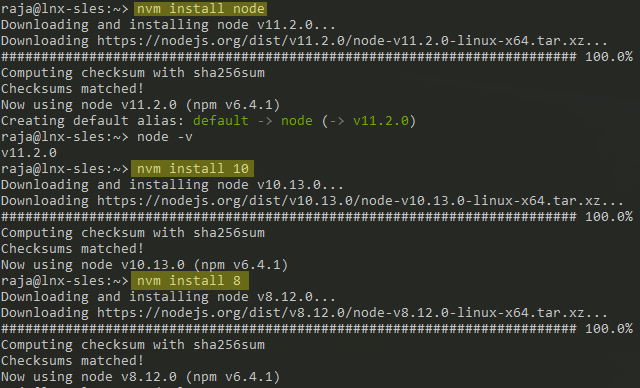 To view the list of Node Js versions installed via Node Version Manager, execute the command nvm ls. 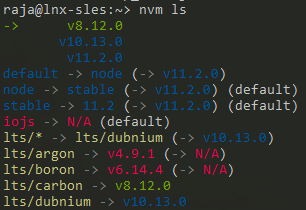 This lists out all the versions of node that are installed and managed by nvm. This also indicates, which version of node is set as default version of node in that machine. To persist the default version of Node Js across sessions, execute the command nvm alias default 8 (version number of node).